Things quietened down a lot during the week after Christmas – I only had a family of three and one couple to look after at the Renen Hotel – and that gave us the opportunity to sample one of the activities that we were going to encourage our guests to take part in – the Snow Scooter safari. Our friend Mats ran the imaginatively named Skotersafari company, which was based in a collection of portacabins on the edge of the lake just a little way out of the village; too far to walk to but just far enough so that the guests had to go by taxi. We used Stefan’s taxis as he had a couple of VW minibuses. He would charge us the equivalent of £30 for the round trip from the pick up outside the Hotel Åregården in the town square and we could pack up to ten people into the minibus and charge them £10 each for the ride, so any trip with more than three people in it and we were making a nice profit, which was cash in our grubby-gloved paws. The ski company would make money on the sales of the snow scooter safari, and pay us our commission, and Mats would also make money so “Everyone’s a winner, Rodney”, as Del Boy would have said. It was a great scam and one excursion that we heavily promoted at our Welcome Meetings. The added bonus was that it wasn’t a hard sell either as pretty much everyone who came to the resort wanted to do that, and the husky dog sleigh rides more than any other excursion. The husky dog adventure was even further out of the village so the taxi fare was more, of course. A group of twelve of us (two taxis’ worth) assembled at the Skotersafari base, wearing full ski gear with gloves and goggles, and Mats took us inside one of the portacabins to explain things. It was rather spartan inside and reminded me of a local town football club’s changing room with a row of benches with wire mesh holders underneath for shoes and boots and a framework running along the back with a row of hooks. We got kitted out with thick dry suits that were either small, medium. large or XXXL and fitted cumbersomely over our own ski clothing before being told to choose the right size winter boots from a line up along the outer wall. Next, we were paired up with the right sized helmet and gathered around a map on the wall. Mats was a six foot something strapping Swede with a healthily weathered and tanned face edged with a grizzly blonde beard and wild hair, usually contained in a hat of some kind. His ice blue eyes shone out above high cheekbones – the ladies liked him but I think he was oblivious to the effect he had on them. He could have been aged anything between twenty five and forty five years old, I really had no idea. He explained the general operation of the snowmobiles and the route we were going to take, pointing out the half way hut where we would stop for a coffee. At this time of year, we would be returning in the dark, so we would get the full experience, but we had to be very, very careful on the return journey as we wouldn’t be able to see the cracks in the ice when we were on the lake. There was a palpable shift in mood at that moment, from excited nervousness to nervous excitement, quickly followed by mild terror as he finished up with “…and if anyone falls off on the way back we won’t be able to see you in the dark so the wolves will get you.” He laughed. No one else did. If I was a guest, I’d be thinking one week in Meribel would have been very nice, thank you. Once outside, we clumped around like a sleuth of bears at a honey-fest and waddled down to the lake side. It was 1.45pm and still light enough for us to see the blue ice of the lake water where the snow had been blown away in big patches like bruised skin. Following Mats’s lead, we each in turn stepped gingerly onto the frozen water, half-expecting it to collapse and be drawn under. It was an odd sensation, stepping from what was clearly a wooden jetty onto the lake – a bit like stepping out onto a glass floor in a tall building – even though we couldn’t see through the ice, as most of it in this immediate area was still covered by snow. The three old wooden boats, moored up with their ropes disappearing into the snow about twenty metres away, served to remind us of what we were walking on. Mats waited patiently for us all to gather round his collection of snowmobiles for the final briefing on the controls. We were about to take control of a Ski-Doo Touring LE which could travel up to seventy five miles per hour. They were two seaters (kids under fourteen could not drive them) and had an engine capacity of 400cc. Mats started one up by pressing the starter button. It was as loud as starting a chain saw in your bathroom. Mrs F, from Wakefield, who was standing too close, chatting to her daughter and not listening to the instructions, jumped a foot in the air and fell down on her backside. I wondered whether the wolves would be devouring her later. Being an avid fan of motorbikes and fast cars myself, I thought it sounded great. Mats left the engine popping and banging to warm it up and the guests either buddied up or grabbed their own scooter. I had spied a rather racy looking green one with a blue and yellow swish down the sides and saddled up. Like a jet ski, you have a cord around your wrist linked to a kill switch so if you do fall off the engine cuts out and the scooter comes to a halt, in theory giving you sufficient time, assuming you have no broken bones or knocked yourself unconscious, to scrabble across the ice or through the deep snow and clamber back on again before those beady eyes and long teeth have you on the menu. I sat on my scooter, feeling quite at home being not too dissimilar to a motorbike, although the thin caterpillar tracks beneath my seat and the short dainty skis out front were a novelty. I looked out across the surface of the frozen lake towards the other side, which was bounded by a dark line of forestation that rose gradually upwards for a few hundred metres before it stopped, revealing a row of snow covered hills. Mats checked we were all OK and had started our machines and then, with a wave of his arm, we were off at what I thought was quite a fast pace for novices. It was bumpier than I had expected and there were some alarmingly large areas of bare ice with crack lines running through them. As we spread out in a line, I became more acutely aware of the sheer scale of the lake. It felt as if we were shrinking into the landscape and we Lilliputians were snowmobiling across the top of a large Christmas cake. Even with a full set of warm ski underwear on, ski jacket and trousers and the big over-suit, I could tell how bitterly cold it was with the wind speed as we raced across the lake. The heated handlebar grips were very welcome too and I could feel the warmth through my ski gloves. The thumb throttle could have done with its own little heat booster, though. Mats slowed a bit and waved people by him, so he could check we were all together, and we passed like a wild west cavalry charge across the plains. Then he accelerated at a tremendous speed, his snowmobile jumping around on the lumps of snow and ice, and took the lead again, this time not slowing down but maintaining his pace so we all had to speed up. We were probably only doing about 50 mph but, because it was such a new sensation for us, it felt like we were doing 100 mph. It was exhilarating but after fifteen minutes of this we were happy to slow down as we reached the far end of the lake and maintained what seemed like a walking pace. We were brought to halt and Mats checked if we were all OK before announcing the next stage of the ride would be off into the country into some fairly deep snow and through the thick dark forest. We must follow in his tracks, no overtaking, watch out for low branches and shift our weight to help the machines along where we could – oh, and if we felt the scooter turning over on top of us then make sure we jump clear. The next twenty minutes or so provided us with a different challenge – that of keeping the thing upright and heading in the right direction. The fresh snow fall had not been compacted yet, so we were ploughing a new course through the trees, our headlight beams bouncing off the snow banks and sturdy trunks of the dense pines and reflecting off the lighter silver birch tree trunks. Up and up we dragged our snowmobiles, through twists and turns of a route Mats must have known like the back of his hand, pausing every now and again when someone in the line got into a bit of difficulty. Finally, we popped out above the cover of the trees and onto a clear piece of snowy wasteland and Mats pushed on ahead, picking up the pace a little. Dutifully we followed him in a line, feeling quite pleased with ourselves that no one had fallen off yet. After five minutes of relatively easy riding, we pulled up near a tiny wooden hut and Mats leaped off his machine and guided each of us into the parking area before ushering us inside. To our astonishment there was a log fire in full blaze and a man busying himself with preparing a dozen coffees in an old black pot. 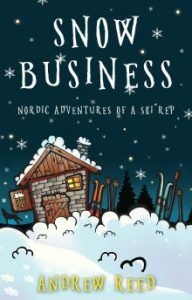 We sat down on wooden benches covered with reindeer skins and huddled around the fire whilst Mats passed around a wooden tray of buns. We were all full of the excitement of the adventure and chatted excitedly, me momentarily forgetting that I was actually working and not on holiday with these people. No sooner had we warmed ourselves up properly than we were zipping up and pulling on our gloves and head gear and saying goodbye and thank you to our host. Stepping outside, we were hit by the dark of night. It had been a cloudy day and now the sun had disappeared and we were out in the wilderness; it was very dark indeed. We couldn’t see the twinkling lights of the resort from here, but the snow cover on the ground contrasted sufficiently with the dark of the trees to help give us some awareness of our surroundings. Mats checked again that we were all OK and warned us about the dangers of going downhill on these machines. Then we were back in the saddle and heading off beyond the hut for a while along a ridge, before plunging down into a small valley and back into the trees for a bumpy, twisty route down to the shore line about half a kilometre along from where we had left it earlier. Stopping briefly to check numbers again and to give us a breather after what had been quite a strenuous ride down, we set off at full chat along the edge of the lake, our headlights picking out the scooters in front and clumps of snow on the frozen surface. We sped along like a line of ants with miners’ lamps, if that were possible, eventually peeling off right and heading diagonally across the blue grey expanse of night time snow cover finally reaching the cluster of portacabins. Seeing the lights of the village beyond and the moving headlights of passing cars up on the road ahead made me appreciate how close I was to the real wilderness just the other side of the lake – apart from the little hut with coffee and buns, of course. I was also excited by the prospect of being able to do this excursion every week if I wanted.